The Glacier Media Group has closed The Richmond Review, a twice-weekly paper that began publishing 83 years ago. Its final edition will be Friday. The Glacier Media Group is closing The Richmond Review, a twice-weekly paper that began publishing 83 years ago. The closing was announced on the paper's Twitter account on Wednesday morning that it's final edition will be on Friday. 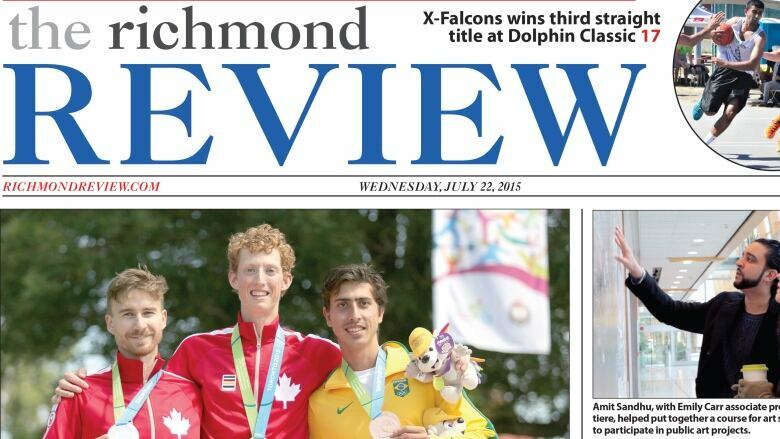 We're sad to report that Friday will be the last edition of the Richmond Review. Thank you <a href="https://twitter.com/hashtag/RichmondBC?src=hash">#RichmondBC</a> for all your support over the years. The news came as a surprise to the tightly-knit newsroom of four journalists, said editor Bhreandain Clugston, the paper's editor since 2000. Clugston said a Glacier representative came to the paper's Richmond office Tuesday afternoon to deliver the bad news. "Everyone was pretty shocked," Clugston said. "We all had a real passion for this community. People say journalism is all about stories. But it's really about the people we interact with." Clugston said all of the paper's journalists are all long-time employees: The sports editor is a 26-year veteran, one reporter has been on staff since 1994 and another since 2005. Clugston took over the editor's position in 2000. His father was editor in the 1970s and his mother was the paper's business manager in the 80s. Glacier also owns The Vancouver Courier, which laid off two journalists, Cheryl Rossi and Andrew Fleming, earlier this week. The company has previously announced it was reducing the Courier's print run from two days to once a week.. Earlier this year, Glacier purchased the Review from Black Press It also acquired Tri-City News,Burnaby NewsLeader, and New Westminster NewsLeader from Black Press. Black Press, in turn, took ownership of the Surrey Now, Langley Advance, and Maple Ridge Times. The Richmond Review employs 14 people, including four journalists. While the closing is a shock, Clugston said it's a difficult time for media companies. "We're surprised, but maybe not 100 per cent surprised," he said.